Dr. Matsumoto joined Arthritis and Rheumatism Associates, P.C. in March 2002, after nine years on the full time faculty, Division of Rheumatology, at The Johns Hopkins University School of Medicine, Baltimore, MD. He continues as an Assistant Professor of Medicine on the part time faculty at Johns Hopkins. While at Hopkins, as well as treating patients, Dr. Matsumoto directed the rheumatology teaching programs for medical residents at Johns Hopkins Hospital and Johns Hopkins Bayview Medical Center. He co-directed the Johns Hopkins Arthritis Website and served as an ad hoc reviewer for JAMA and Medicine. His research interests included the use of novel therapeutic agents for the treatments of rheumatic diseases. He is a Fellow of the American College of Rheumatology and a member of the American College of Physicians. He was included in Washingtonian magazine’s list of “Best Doctors” as an outstanding specialist in the field of Rheumatology. Dr. Matsumoto was awarded his B.S. degree from Stanford University in 1981 and his medical degree from the University of Illinois at Chicago in 1985, where he was elected to Alpha Omega Alpha, the medical honor society. His Internal Medicine Internship and Residency were served at the University of Medicine and Dentistry of New Jersey, Robert Wood Johnson Medical School, where in his final year he was Chief Resident at the Medical Center at Princeton. He completed his Fellowship training in Rheumatic Diseases at Johns Hopkins University School of Medicine in1993 where he was awarded a Howard Hughes Postdoctoral Fellowship for Physicians. 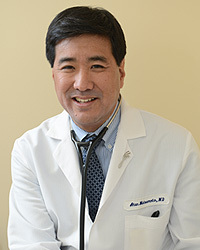 Dr. Matsumoto is Board Certified in Internal Medicine and Rheumatology. “I liked Dr. Matsumoto. He was on time, he listened carefully, he took my concerns seriously, and he explained his findings in a clear and understandable manner.” ~ Sharon S.